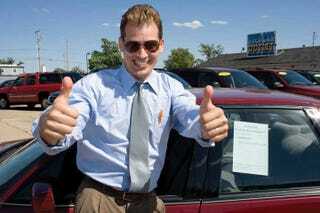 As an automotive buyer's consultant I have dealt with a lot of salespeople. Most of them are good, some of them not so good. In my last installment, I told you how to spot the good ones. Sometimes we are not so lucky. The absolute worst sales experience I ever had didn't happen at a car dealership; it happened when I needed windows for my house. After talking in circles for over 2 hours and not directly answering our questions, he brings out the price sheet. "If we can agree on a price, will you sign a contract today?" -"Well, we want to see an itemized breakdown of the costs." -"Maybe, but I want to see it all in writing, you just gave us a final figure." He reluctantly scribbles more details on the sheet. "So will you sign it now?" -"No, we will think it over and get back to you." -"O.k. then you can have it back." "Alright you can think it over, but I need to know today." -"Fine we will call you later." The man leaves and not 5 minutes after the door closes my wife and I look at each other and say, "No way are we going with them." Then about 30 minutes later we discover he "accidentally" left his tape measure behind. I give the guy a call, "Hey, you left your tape behind if you are still in the area I can put it in my mailbox if you like." He says, "It's o.k. I'll pick it up on Monday when I get your contract." -"Yeah...about that, we have decided to go with someone else." Now things get really interesting, the man is clearly upset on the phone. "WHAT? I CAN'T BELIEVE THIS! YOU SAID YOU WOULD SIGN IT. I'M GONNA LOSE MY JOB OVER THIS. I TOLD YOU I WAS NOT ALLOWED TO LEAVE YOU WITH AN UNSIGNED CONTRACT AND THIS IS WHAT YOU DO TO ME?" -"Hey, it's not that big of a deal I can just throw out the paper and you can pretend you never gave it to us." "Can you at least tell me what I did to make you change your mind?" -"To be honest...it was the sales tactics you used. We just aren't comfortable going with a company that represents themselves that way." "SALES TACTICS? I didn't use any sales tactics!" -"Yeah you did, in fact you used pretty much every one in the book." "NO. YOU ARE A LIAR. YOU ARE A DISHONEST MAN. I CANNOT BELIEVE YOU DID THIS TO ME!" -"Whoa, don't take it so personally it's just windows." "YOU DON'T UNDERSTAND. YOU ARE GOING TO MAKE ME LOSE MY JOB. I WANT YOU TO DRIVE THE CONTRACT TO MY HOUSE." -"That's not going to happen. I can mail it to you. What is your address?" "I"M NOT GIVING YOU MY ADDRESS; I DON'T TRUST YOU." -"Well, I have the fax number here for your corporate office; I'll just fax the contract with VOID on it that way there is no confusion. Have a nice day." "NO, YOU LISTEN TO ME…." and I hung up the phone. The rest of the day my wife and I just felt aggravated that we spent over two hours with what seemed like a con-man. I have a hard time believing anyone on a car lot would be this bad. A few yeas back, I was helping my mom shop for a new Jetta (I know, let's not go there). I found it odd that the 24k SEL model she was going to get had rear-drum brakes. When I brought up the fact that rear-drums were strange on a 24k car the salesperson said, "Oh man, they are the newest thing. All the brands are switching to rear-drums. They are much safer." When I asked why all the Audis on the lot still had 4-wheel discs he didn't quite have an answer. Again this comes back to product knowledge but the correct thing to say was, "The front brakes do the large majority of the work and most drivers probably won't notice the difference." If you ask for the best price on a car and they return with, "Well what do you want your monthly payments to look like?" That is not acceptable, you can do the monthly math later. I get that most folks on the floor need to talk to the manager before giving a price but if you ask for the sale price they should give you the sale price not the runaround. One time I considered buying a new Honda Fit Sport. I had the price worked down and then saw an $500 "executive package" fee applied to the car. I asked about it, and the manager said, "Oh that includes our VIN etching and paint protectant." -"Really? Remove that fee or no sale." Then the manager said, "Well, our customers appreciate those types of extras on their cars." -"Ma'am, with all due respect, your customers are idiots. You just lost the sale." I get it is the end of the month and the incentives change which could change the price. But if I want to walk away and think about it, let me walk away and think about it. And if anyone tries to play the, "We can't find the keys to your trade" trick, RUN AWAY! Most car-buyers want to be nice about it and not make a big deal when then encounter the above behavior, but if you feel uncomfortable do not hesitate to request a different salesperson. Here is a little industry insider info that is sure to get me some nasty messages from dealerships…you know those phone calls and surveys that ask about your experience? Sales staff and manager bonuses often depend on you giving the dealership high scores on those surveys. So, it is in their interest to get you someone competent. I wanted to keep the red-flags to a top 5, if you have any more be sure to drop them in the comments.